As part of the INSPIRE circle, I make up two quilt blocks a month, and mail them to a group member who takes all our finished blocks and makes them into a lovely quilt. 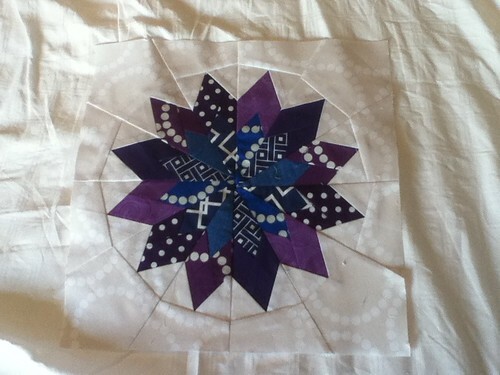 This month the blocks were a beautiful paper-pieced star, which I have to confess made me a little bit nervous, since I’ve never paper pieced before. Turns out I love it! I’m proud of it. The background fabric is the handwriting print from Architextures, and I have to say, I fell in love with it while I was making this block. I’m not as fond of this one: the blues and purples are too close in value to give the kind of inner pop that the yellow does in the first block. And the background is a pearl bracelets in almost-white, which works, but it turns out I’m not as much of a fan of that print (which I usually love) in such a low-volume context. Live and learn! I’ve also been working on a quilt for a friend’s new baby, (I’ve got a few months of lead time there, though) and have two finished quilts that I have to photograph before I mail them off to their expectant mother. Those two are on a serious deadline. Thanks! 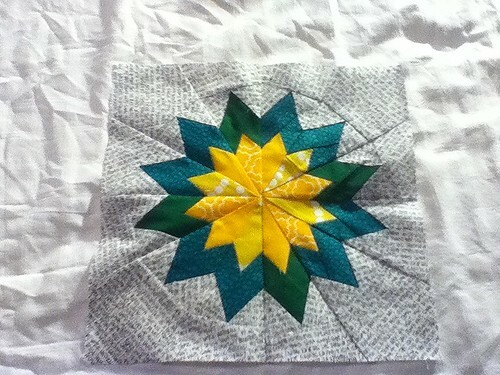 It turns out I really like paper piecing! Previous Previous post: Recipientless baby quilt and Fresh Sewing Day linkup.